Abby Durfee Gray Borden and Andrew Jackson Borden, August 6, 1892. Click on thumbnail photo for larger view. 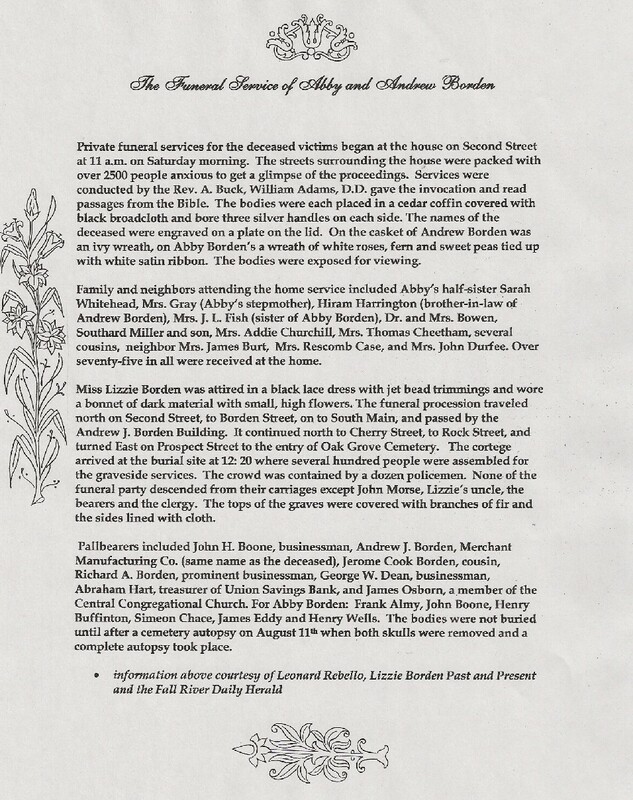 how far is this cemetery from the Lizzie Borden House? By car, Oak Grove is only about a 5 minute drive from the Borden House, straight up High Street, right at the fork, right onto Prospect Street, and straight into the cemetery. You can find numerous excellent funeral songs to pick from whenever preparing a funeral for a cherished one or friend. Songs can array from different styles and they don’t essentially all need to be of the spiritual nature. The belief primarily is that funeral hymns are probably the most well-liked and therefore are performed much more often at funeral or memorial services nevertheless, there are a lot of additional funeral tunes that households choose from. Are you able to tell me if a Madeline Myers (Meyers) is buried in Oak Grove? She once lived on Prospect Street. She died on October 30, 1958. If you call the Oak Grove office between Mon-Friday 9-3, someone can look up that information for you. I have a question about the huge almost like moseleum in Oak Grove Cemetery, it has 2 Freemason symbols in each corner. Could you tell me what this place was used for? I think you are referring to the Hargraves mausoleum. It contains members of the family. The door is in such bad condition that it was chained shut years ago.The Hargraves were prominent in soap manufacture and shipping. I noticed that the Hargreaves mausoleum, the one that is chained, has several of the tombs inside been broken, were these broken into, and if so what was the outcome with that situation, it’s actually quite horrible, and I always wonder every time I walk by it. It has been chained up as long as I can remember to keep people out. Even with chains it is full of trash and leaves inside.